Following The Equator: Voyages of Equinox: Happy Independence Day, again! One good Independence Day follows another! Did you know that the Bahamas celebrates their independence on July 10th? Yes indeed! While they cheerfully celebrate the national holidays of all countries (ours included) due to the large role that tourism plays in their nation, they have a wonderful time celebrating their own holidays! The blue, yellow and black Bahamian flag flies proudly, with float parades, and special events from church services to family fun days, to junkanoos – a masked and wildly decorated parade of drummers and dancers that combines a bit of Mardi Gras mixed with West African roots, and spiced with island flavor. The celebrations reach all communities throughout the nation, and its a fun time indeed! of the Bahamas in this photo from MODIS, courtesy of NASA. From Spanish rule to Dutch, the Bahamas changed hands yet again when they were claimed by the English in 1670. 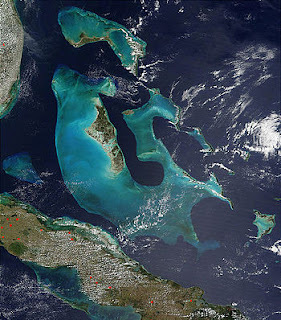 For the next 300 years, the Bahamas remained mainly under British rule. (The one exception was a brief one-year return to Spanish rule in 1782, before the British ruled once more.) In 1838, slavery was abolished, and many former slaves remained on the land and eventually became land-owners themselves. Although all residents of the Bahamas were free, the Islands remained a colony of the United Kingdom, and were eventually granted limited self-government in 1964. The Bahamas became a British Commonwealth in 1969, officially ending the colonial rule, and finally, the Islands became a nation on July 10, 1973. Since then, during the past 38 years, the Bahamas has evolved from a small colony on the periphery of the British Empire into a vibrant democracy, with tourism and international banking the largest part of their economy. We can attest to the genuine warmth and welcoming attitude of the Bahamian people; their hospitality and willingness to share their beautiful islands is one of the reasons we enjoy cruising here so much. Definitely a cause for celebration, in my book! Happy Independence Day, Bahamas!